Sumeet wrote: We should go ahead and order 36 or 54 more Rafale for IAF in F4 config in addition to India specific enhancements. Make Dassault go faster on delivery. To make up for squadron numbers HAL, Dassault everyone has to pitch in aircrafts simultaneously. That is the best way to proceed now that SC has cleared the deal. Let it be burnol time for RG & Co. In return press Dassault, Safran to help with AMCA program. Little to be paid till 2023 or so. Won't we be a 4T$ economy by then? I am sure Dassault would love the continuity of the program to write down their costs and keep workforce employed. We can have a severance clause to protect us in case of financial emergency (and keep it specific to that contingency so such a clause would be acceptable to all). We can now afford 36 more easily, they will cost only about ~5B now, including weapons. A lot of us have been professing buying 2 more Sq since the moment this G2G deal was announced. That will bring down unit cost from 1600Cr too, reducing impact of Pappu's lies. JayS wrote: We can now afford 36 more easily, they will cost only about ~5B now, including weapons. A lot of us have been professing buying 2 more Sq since the moment this G2G deal was announced. Invest those savings in making life easier for the infantry!!! Don't discount inflation though ... esp given the time it'll take for MoD to make a decision. ^^^^ Unless we find the moles in MoD who released this information to him and prosecute them simultaneously on the same charges facing severe punishment, this will unfortunately be viewed as a witch hunt. Michel didn't create this information. He purchased it from someone who was willfully violating the service rules and performing treason. Michel was doing his job as a middleman however low-life that line of business may be. The moles were doing treachery as GoI employees with access to highly sensitive information. We need to find them and throw the book at them. Saar, this frankly is a straw man argument. Its not like they are taking money from IA's budget and buying Rafales out of it. Even the budgeted money is not spent fully. Every year significant money is returned unspent. I would guess majority of it from IA's budget. whose inflation..? ours or European..? Rafale deal considers European inflation and then to caps it to certain value, cant remember exact value but I think its 3.5%. Also If my memory serves right the G2G deal itself have a option for 36 more Rafales. GOI can simply chose to exercise the option and scrap MMRCA 2.0 tamasha. No decision delay issue. Add Rs Depreciation of 4-6% a year to that as well. JayS wrote: whose inflation..? ours or European..? Rafale deal considers European inflation and then to caps it to certain value, cant remember exact value but I think its 3.5%. Also If my memory serves right the G2G deal itself have a option for 36 more Rafales. GOI can simply chose to exercise the option and scrap MMRCA 2.0 tamasha. No decision delay issue. Then lets consider GDP growth too. See its not a simple math. IAF has already spent about 3B dollar on establishing 2 bases and India specific development. We should take full advantage of it. There is ZERO opportunity cost involved now. I too strongly believe that we should go for min 03 more sq. i.e. 54-60 Rafales instead of waiting for MMRCA. Though I also want MMRCA to take its due course. Simply because it won't reflect on good ethics of our country. Regarding Rafales, I have few naive curiosities which comes from my optimistic wishes about Kaveri and Uttam. 2] No weapons deal - lets go for our own weapons. 3] Deal should be made in 2 parts - flyaway aircraft and maintenance. 2 deals should be declared with few months gap in between. This is specifically to avoid dramaz in future. 4] With #1 and #2, I suppose that price should come down significantly. It shouldn't be like Dassault is buying from DRDO and then putting its margin on top of it. Regarding MMRCA, It should take its due course. But MoD needs to be careful (I am assuming BJP will be back in power). 1] If Rafale is selected and Offshore manufacturing goes to DRAL, there will be ruckus again. 2] I would like to see a forced public-private alliance (HAL+Any Private) to take over offshore manufacturing. 3] I also wish that HAL should be transformed into world-class organization which should stand example to other PSUs. If right efforts and consultancy is taken, it is definitely possible in 3-5 years. 4] Though 42 sq. is what we look for min strength, Our planning should target for 50 sq. If we target only for 42 sq., I am sure the day won't be long when IAF will struggle to maintain 42 at least in near 20-25 years. rkhanna wrote: Add Rs Depreciation of 4-6% a year to that as well. Add the unit cost ($3.8 Billion) + the cost for India Specific Enhancements ($2 Billion) + the cost for weapons ($1.2 Billion) = $7 billion. The IAF will be saving a whole $2 billion extra over the first deal. Both Hasimara and Ambala are being built with infrastructure to house two Rafale squadrons each. In the first deal, each Rafale works out to approx $250 million. 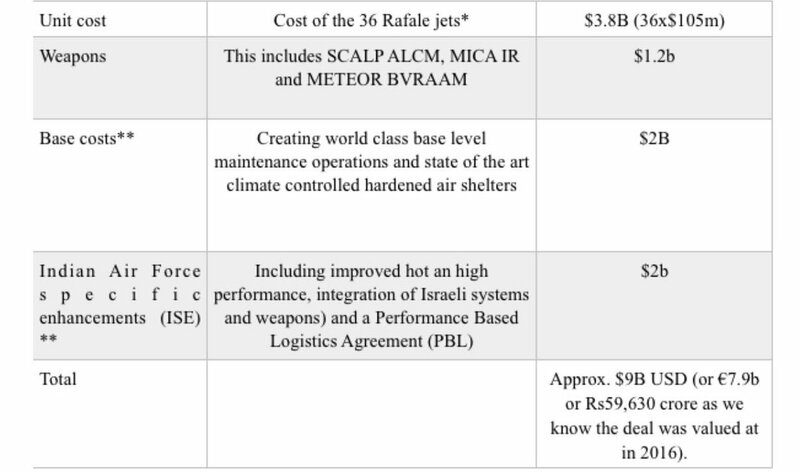 If another 36 are ordered, each aircraft works out to approx $195 million based on the table below. But even that price can be negotiated down further if additional birds are purchased. We could negotiate the price down even further for the ISE and weapons as well. Now before anyone gets asthma attack on seeing these numbers, please remember MMRCA 2.0 will work out to be the same by the time one factors in the factory for screwdrivergiri + tools + jigs, weapons, base infrastructure, India Specific Enhancements, etc, etc, etc. Hasimara AFS will be the premier base for the Rafale. Ambala AFS will be more like a satellite AFS for the Rafale, but will have the necessary infrastructure to support air operations including Rafale flight simulators. Any additional air bases over Hasimara, will be a model based on Ambala. Even on airbase costs, it will be cheaper. @ JayS: I will respond to your questions - about the video - soon. Sorry saar, been busy the past couple of days. Rakesh wrote: If any of you have Amazon Prime, please watch this video. Fairly recent (2016 vintage), but a great documentary. Rakesh ji, can I share your comments about this documentary in my friends whatsapp group, my intention is to encourage them to watch it as they have amazon prime. I sorely miss Manohar Parrikar. For all her forceful and effective way of talking, current RM simply lacks capability to give pointed technical rebuttals to many questions. She gives out facts not technical explanations. JayS wrote: I sorely miss Manohar Parrikar. For all her forceful and effective way of talking, current RM simply lacks capability to give pointed technical rebuttals to many questions. She gives out facts not technical explanations. sorry for OT. I dont post much here just read. Hope not to tread on you or others. most of the minsters are just local satraps who won elections in their areas or thru RS into parliament. They can only give facts due to their limitations and qualifications. technical details will be gobbled up by similar other technical people as here. But common Indian has to get the understanding that the minister is sincere honest and hard working. on that score NS is effective. She appears a ordinary woman with huge responsibility and talks sense. neither on cost nor on time, not to mention the other huge elephant in the room which he very conveniently did not mention. It is time to stop fooling people. Dassault Aviation delivered 12 Rafale fighter jets in 2018, including three jets delivered to France and nine elsewhere, compared to nine deliveries in 2017, the company reports. In 2018, Dassault took orders for 12 Rafale jets as Qatar took options for the aircraft. Dassault’s backlog includes 101 Rafales, flat with its backlog on Dec. 31, 2017. Meanwhile, Dassault delivered 41 new Falcon business jets in 2018, down from 49 in 2017, the company says. Deliveries were consistent with its delivery forecast. Its backlog includes 53 Falcon jets, not including orders for the canceled Falcon 5X business jet. That compares with 52 Falcon jets a year ago, which includes some Falcon 5X jets, the company said. In 2018, the company took net orders for 42 business jets compared to 38 in 2017. In December 2017, Dassault canceled the Falcon 5X program following technical issues and a years-long delay with Safran’s Silvercrest engines. Instead, Dassault unveiled the Falcon 6X longer-range variant in February, with Pratt & Whitney engines. The aircraft is expected to make its first flight in early 2021 with deliveries to begin in 2022. HAL still takes 2.2x man hours to make Su 30 MKIs and the retired MD is claiming he would match Dassault’s productivity with his 50% arakshan work force. just like the semi-literate white folk in the American states who voted Trump a vast majority of Indians do not know what the Rafale actually is but only know there is a controversy around it.. and RaGa and his advisors are seeing to it that it stays so., such is the sad state of Indian politics ..but then if that can happen in America ..what can change in India ? Internet and mass media is something that can bring out the truth .. more the publicity for the right and calling out the liars for what they are.. no way around it. This. I couldn't believe my eyes at the ridiculous claims he was making and the ease at which the journalist lapped it up. Russian built Su-30MKIs are far cheaper than those built by HAL, even after ~20 years of manufacturing and he wants the GoI to trust it to manufacture a small order of 28-36 Rafales? There's also a statement released by HAL workers union that contains a litany of excuses and accusations against the GoI. We need to ignore both of these statements as they're nothing more than political statements (RG met with a delegation of HAL employees in Delhi yest.). Yes it is. That video is in Spanish though, but enjoy the visuals. It is an absolute treat! @JayS: That is the video above. Answering your queries now. JayS wrote: IIRC it was HAL who quoted that figure from their side, wasn't Dassaults estimation. I wrote a post in this thread some time back on why I think that figure I feel is reasonable and even if it was Boeing or LM taking up Rafale manufacturing they would have quoted similar number. But more importantly, how exactly you deduced that the process is "ridiculously complex"..? I mean to say, every fighter or civilian jet, bar none, have ridiculously complex manufacturing process. How does one for Rafale stand vis-à-vis other fighter manufacturing..? In fact if its significantly more complex than other Fighters' then it can be considered as a "bad" design - something which has no good manufacturability. Anyway Europeans have a habit of doing things in a complicated manner. So its expected to some extent, but certainly not something which is not in the ballpark for typical fighter. Saar, major caveat. I am a mango abdul who got over excited at watching a great Rafale documentary. Recently, the former MD of HAL said that they can match Dassault's delivery time of 100 Rafale jets. But I doubt that will be delivered at the same cost as they do at the Dassault plant in Merignac. Just like how HAL-built Su-30MKIs are more expensive than Russian built ones, I doubt HAL can deliver a Rafale at the same cost as a French built one. In the same vein, I don't know even if DRAL can pull this off. I am transcribing the commentary as I hear it from the video (which I am watching again). I will leave it to you to determine whether this is ridiculously complex to build or not. Everything you see below in quotes is what I am hearing the narrator (or the interviewees) say. Follow the video in kit's post (which will help, when you read below). And the build part actually starts only at 28:48 in the video. From 9:45 onwards in the video it says, "To design the Rafale in 1981, Dassault developed a revolutionary software suite called CATIA (https://en.wikipedia.org/wiki/CATIA). This digital mockup is the central database, the specifications reference shared by everyone inside the company. This mock-up allows the plane to be virtually designed to the nearest 10th of a millimetre. With it the engineers of Dassault and their 500 industrial partners can work together simultaneously at distance. CATIA also anticipates each stage of manufacturing. We can add into this digital mock-up virtual human mechanics who allow us to virtually grasp electronic modules and wiring we see on screen. Then we can perform maintenance simulations during the design phases." From 10:52 onwards in the video it says, "The tool they developed is out of this world. Its now used to manufacture civil aircraft worldwide and automobiles everywhere. The best tool in the world is called CATIA. (Too Much Hubris!) It was developed by Dassault for its planes and now its sold across the world by Dassault Systems, the subsidiary of the Dassault Group, which continues to develop the tool. CATIA does not stop there. The software not only allows engineers to design a plane down to the minutest detail, its also used for upstream planning of manufacturing plants, assembly chains, robotics and onsite configuration. Everything is designed and simulated by CATIA. The Rafale's secret lies in its 100% virtual design, combined with amazingly meticulous work carried by those known as its companions (look like assembly personnel, but are much more than that). One example - for the flight controls - the companions must assemble over 1,200 parts to the nearest micron. The companions need to have a lot of know how because the small size of the parts makes their work very technical and this can only be done by a human hand which can position and adjust parts to the nearest millimetre. You need incredibly precise know how to able to assemble parts easily in the correct order." From 12:12 onwards in the video it says, "Everything is assembled in the Dassault plant in Merignac near Bordeaux. The computer designed parts made in a dozen other factories in France fit together perfectly. Each plane represents two years of labour. A total of 7,000 people work in France on the Rafale. Today (this documentary was made in 2016), an average of 11 a year (which is correct) leave the Merignac plant. And by 2018 (did not happen), production should have tripled." From 28:48 onwards in the video it says, "The Rafale's DNA is a mixture of the synergy between the ultra-disciplined design process and the extreme skills of the companions at the Dassault plant. The best example of this is in the manufacturing of the wings. The Martignas factory manufactures the air foils, a process which is both mechanical and composite. The parts are then sent to the neighbouring Merignac factory where they are assembled onto the fuselages. Some manufacturing steps are, of course, carried out by robots. Others done completely by human hand. The finishing touches are worthy of a Rolls-Royce. The external panels are given a special coating. These are then placed onto the main structure. The companions of Dassault Aviation fix them screw by screw. A quality control expert will then check air tightness and water tightness by injecting a gas. The last step, a technical uses this small electronic eye to check that everything conforms to the blueprint produced by the computer. This laser inspects down to the nearest hundredth of a millimetre. Now all the elements of the wings have been assembled." JayS wrote: That's interesting. I think it hints at LO skin of Rafale. Nothing else can demand such check or grinding. Yes, it looked like maintenance for the LO skin. You can see that process from 31:50 onwards in the video. I do not know what the IAF does, but slaughter houses (which attracts birds) are a major problem at air force stations in India. I have read a number of articles - over the years - about the air force consistently trying to shut down slaughter houses, but to no avail. PS: Just went thru a bit of it. Can't blame you admiral for getting impressed by the swanky visuals. Will reply to your other post later. But notice something at 28:00. Notice the position of Canard while Landing on Carrier. Exactly like LEVCON on NLCA. why to bring reservation into discussion. that is completely not required. Admiral, thanks for taking so much efforts to write all that down. Much appreciated. I ran through the documentary in French. Its all very impressive and basically engineering *****. All the things they have shown are pretty much standard in industry. Nothing particularly TFTA for Dassault or something that anyone like ADA or HAL cannot easily buy and use. But most importantly all that part is for design. If HAL takes up Screwdrivergiri of Rafale they are not gonna need all of it. At best only a small part of it. ADA is moving to Siemens PLM system it seems from the tenders I saw, they will have all such TFTA stuff soon or already have it for all I know. A lot that is shown and said is marketing sugarcoating of pretty much standard stuff, you know things like tenth of a millimeter and so on. Some of the precision needed is because of LO requirements. We don't make LO planes so far, why waste time and efforts in making TFTA stuff if its not demanded by the design..? Our guys will develop such processes for AMCA or even LCA MK2 for sure where it will be necessary to have them. Every airplane wing goes through the same process of sealing and quality check leakage because they are basically fuel tanks and you don't want fuel to leak now do you..? We are definitely behind the curve, but not so much that it should make are go around with begging bowl. And not every TFTA tool is needed for good engineering. Its helpful but not necessary always. After all they were making awesome planes like Sr71 and MiG 25 when there was no CAD whatsoever...!! Didn't we have LCA parts make to some 10 micron standard? Aren't we there already? Tolerances depend on form, fit and function of the component. They are not always very tight. Some components also have tolerances running in inches. The designer has to consider the interplay of Cost, Quality and Performance while setting up tolerances. One can achieve targets on max only two of them at a time typically. fanne wrote: Didn't we have LCA parts make to some 10 micron standard? Aren't we there already? The HAL plans to take the production rate to 16 aircraft per year from 2017 onwards. The facility will be upgraded to a major manufacturing complex consisting of sheet metal shop, process shop and heat treatment shop. Additional hangars are also coming up for support and maintenance, with further augmentation in the pipeline to accommodate the Tejas trainers and naval variant. All hangars are equipped with forced draft systems to maintain dust, humidity and temperature control. The HAL has given the mandate to head the new facility to V Sridharan, who has worked extensively on Jaguar and Hawk programmes. “We have embedded the Tejas production with best lean practices in manufacturing. Maintaining highest quality standards have been the driving philosophy behind, while setting up this unit,” HAL chairman R K Tyagi told Express from Delhi. Batting for the private industry, the HAL said a total of 9,362 fabricated parts will be manufactured by its external supply chain. “This step is critical in propelling HAL as a lead integrator in the national aerospace ecosystem,” Tyagi said. A gen-next 5-axis CNC machine installed at the facility is capable of robotically undertaking the wing skin drilling, thereby reducing the turnaround time by 80 per cent. The manufacturing jigs have been calibrated with computer-aided laser tracker to 80 micron tolerance. The manufacturing shop has been equipped with appropriate CAD software for working with digital mockup features. You do not see it that way and u r entitled to your opinion. IAF certainly can use a "bomb truck"
IAF is the operator, not Karnad. They know what suits them best. He was insulting a force when insinuating they are are "fascinated"
"Besotted by Western-origin aircraft, the IAF had hoped to use the initial order of 36 Rafales as a wedge to procure 90 more. That ruse being blown, it has indented for 114 new type single-engine MMRCA. With Donald Trump turning up the pressure, the 1960s vintage, museum-ready F-16 is likely to be the gap filler. It will pose no danger to the Pakistan Air Force that has been operating this plane for 30-odd years, but will fritter away resources and exacerbate an already hellish logistics problem for the IAF, created by the unmanageable diversity of aircraft in its inventory, each requiring its own expensive maintenance infrastructure." His prescription for the next 20 yr ?..keep using Sukhois that may be state of the art now. . Does he really know what the IAF is up against? Maybe the IAF doesn't require a qualitative edge in some way?